Notes: Designed by Mike Mercer of Redding, CA. 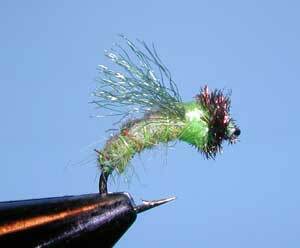 as a caddis pupa pattern. 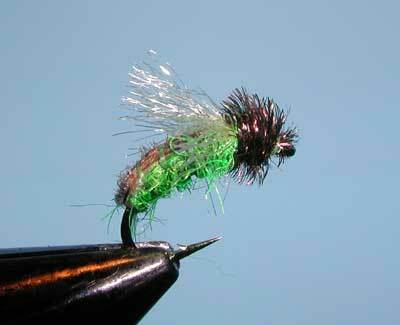 There are usually three color variations to this pattern: Olive, Caddis Green, and Amber. The fly shows distinct contrast with a darker back and a lighter dubbed body.The back is generally Turkey Tail but Mike has also used Marabou. 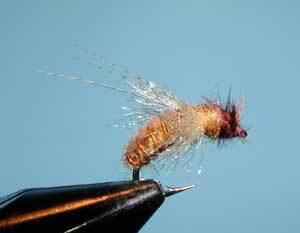 A collar of Antron, in front of the wings, is used at times to provide the distinction of the emerging caddis. A good mid-day pattern, fish it deep under an indicator with a rising action. The fly has also been used in stillwater conditions using short strips.